The new constitution would see new laws and policies seeking to maintain the socialist and revolutionary character of the Cuban state. 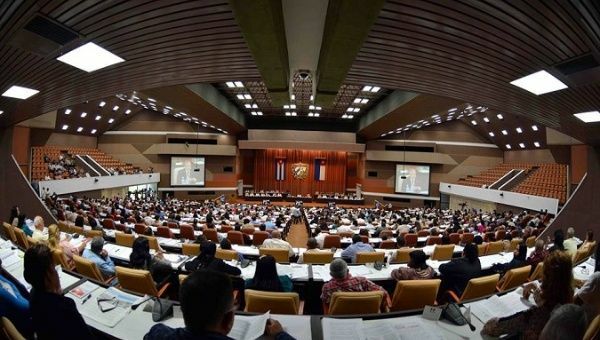 July 23 (teleSUR) The Cuban parliament unanimously approved the Constitution Project Sunday, which will be submitted for a popular consultation from August 13 to November 15 of this year. After two days of debate in the legislative plenary, the lawmakers voted and approved the Constitution Project of the Republic of Cuba with the modifications made during its analysis. “The previous study of the sustained debate has been very useful, a passionate, committed, critical, patriotic and contributory debate centered on the humanism of Fidel and Raúl,” the president said. The new constitution will see new policies that will seek to maintain the socialist and revolutionary character of the Cuban state with a focus on promoting economic growth and social policies that would benefit the entire Cuban population and minorities in the country. One of the major changes to the constitution would be the recognition of gay marriage and the strengthening LGBT rights.